Yoga's popularity is on the rise, with studios and classes sprouting up all over. Have you ventured into a studio near you? Is the curiosity there, but you’re uncertain of what to expect? Finding the courage to step in and try a class is the first step in creating your yoga practice. Yoga unites the mind, body and soul, promoting holistic health and awareness. We work to achieve this unity by practicing the postures (also known as poses or asanas). For many of us, the hours of the day fly by, and adding an additional hour-long yoga class seems like an impossible stretch. However, making time for yoga can start to bring balance into your life by offering some stillness for the mind, movement for the body and peace for the soul. A regular yoga practice can begin to slow you down and help you live your days with a little more stillness and awareness to the present moment. Making the time to attend a regularly scheduled class can help you to develop your own unique practice. The practice of yoga is not about putting your foot behind your head as it can sometimes be portrayed in movies or magazines. A more accurate depiction would be the instruction of grounding your foot to the floor in a balancing pose with awareness and taking a conscious deep breath. The practice of yoga is a path of continued growth and development. If a goal is met to achieve a certain posture, it can be quickly replaced with a new goal as there are thousands of yoga poses. Yoga is an individual practice and not a competition. 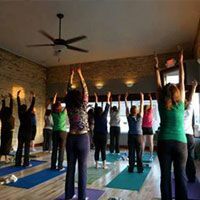 There are numerous types of yoga and a basic class offers accessibility to most individuals.There may be a day where you come to a yoga class just for savasana, and this is more than acceptable. Savasana is also known as “final rest” or “corpse pose” and is the last five to ten minutes of class where you allow for complete relaxation to soak in all the benefits of your yoga practice. It is a very important part of class as you give yourself permission to completely let everything go and just rest: concept often neglected in our fast paced society. Most basic yoga classes focus on taking time to sit and connect to your breath; move through a series of standing postures that strengthen and lengthen the legs, arms, back, and core; practice balancing postures; and then move to floor asanas that stretch the hips and back. Some yoga instructors play music in the background during class and some prefer the quiet focus of the inhale and exhale. Music and sound can offer a tremendous gift of healing while we practice yoga as it provides an escape for the mind and soothes the soul. Treat yourself to a yoga class accompanied by the energy of the healing sound bowls and you will experience what it truly feels like to unite mind, body and spirit. — it will be life changing! Balance on Buffalo, which exists as an oasis, providing a safe and nurturing space in which to manifest and empower your own innate capacity to heal. Massage therapy and bodywork, sound massage and reiki, coupled with our ongoing yoga classes, kirtan and special workshops are all intended to spark an unfolding of the beauty and human potential that each of us carry within. We are here to guide and nurture a greater awareness and unification of mind, body, heart and spirit by exploring the space that divides them.